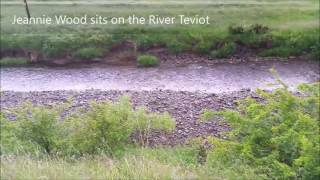 Situated in the the picturesque Teviot Valley about 10 miles south of Hawick, Jeannie Wood has beautiful views of the surrounding countryside and with its river access it is sure to spark the interest of those with a passion for angling. The centre of the River Teviot forms the south eastern boundary of the woodland, providing roughly a hundred metres of well stocked river. According to the local angling association Sea Trout and Salmon migrate up this stretch of river. There are also indigenous species such as Brown Trout and Grayling. It is not only fish that are attracted to the river: a Roe Deer may be seen at the eastern corner of Jeannie Wood, a favourite crossing point, drinking the clear waters with her two spotted fawns, before bounding off over the fields in convoy. The woodland benefits from an easy vehicle approach across the fields and along the woodland track to a ridestop at the entrance. Here a substantial hard standing makes a very useful area to stack timber awaiting collection or park: a convenient and durable bench helps this spot to be enjoyed. A path leads away from here into the Norway spruce plantation which is around 20 years old. On the eastern and southern edges of the woodland some very nice broadleaf areas can be found, mostly oak and ash. Wandering through the woodland and around the fringes, woodland flowers such as wild roses and delicate and fragrant orchids are to be found. The woodland is also home to an abundance of funghi that enjoy the shelter of the coniferous canopy. The timber that the woodland will yield will be suitable for many uses. Initially the Norway spruce would benefit from being thinned and harvested, perhaps for firewood, though the wood has a good resistance to rot. Over time the oak and ash will provide very useful timber for crafts or for heating too. For those interested in coppicing, ash makes an excellent crop and because it is pliable especially when steamed, stable and tough it can be used to make many products from baskets to chairs. Whiling away the time, Jeannie Wood is a great place to sit, camp and enjoy nature, while watching a coppice crop grow. The boundary of Jeannie Wood is clearly marked by posts topped in blue paint along the south western, western, northern and eastern sides of the woodland. The south eastern boundary is the centre line of the River Teviot. Jeannie Wood is well connected via the scenic A7 and is around 35 miles north of Carlisle, 15 miles north of Langholm and 10 miles south of Hawick. To get to the woodland simply drive along the A7 to the postcode of TD9 0LG near the small village of Teviothead. At the sign to Falnash near the Armstrong Johnnie Gallery cross the River Teviot using the temporary bridge and take an immediate right once over the bridge. Follow the track to just before the closed farm gate with cattlegrid and park safely at the small junction on the left. Proceed on foot through the farm gate (remembering to close it after you) and walk along the track beside the river. Continue along this track through an open gateway up to the locked woodland gate. Climb carefully over the stile and continue walking along the track for about 500m where you will find the entrance to Jeannie Wood on your right. A key to the locked gate will be provided upon purchase of the woodland and a right of way will allow you to drive all the way to your woodland.